A collection of traditional round Indian rugs, handmade in a stunning Aubusson design. 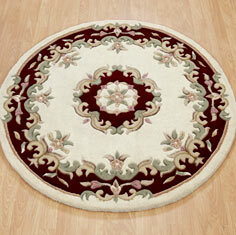 Mahal rugs are made from 100% wool, the pile is hand-carved. The round size is available is 120cm diameter only, made to measure sizes are available to order.